Andre Raymond Perron, Esq. is a managing partner with Barnes Walker and chairman of the Barnes Walker Business Trial Group. He is recognized by the State of Florida Bar Association as a specialist in business litigation having met the standards of certification. This is a distinctive accomplishment in that certification is limited to only those trial lawyers who have demonstrated exceptional skill, experience, and knowledge in business litigation; less than five percent (5%) of the 50,000 members of the Florida Bar have achieved this certification. 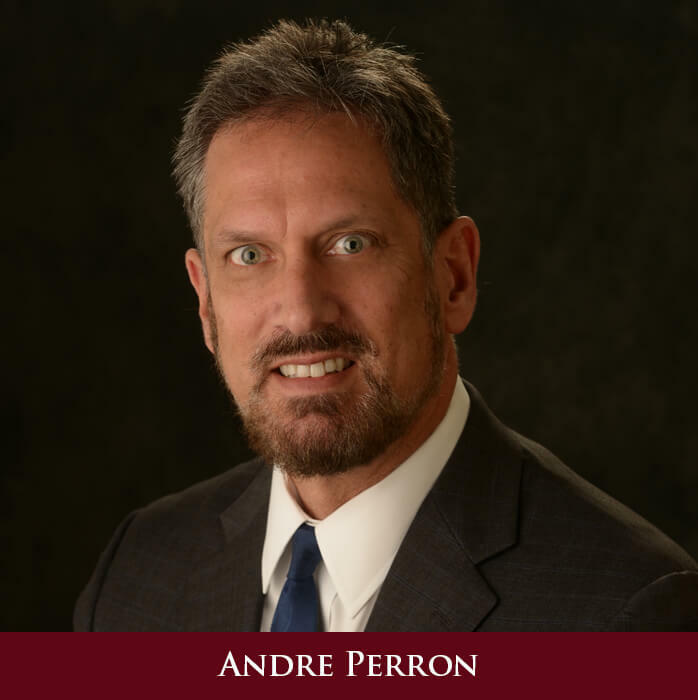 With over 30 years of practice in State and Federal courts in Florida, as well as in arbitration and mediation, Mr. Perron is a member in good standing of the Florida Bar, the Federal Court for the Northern, Southern, and Middle Districts of Florida, and with the Fifth and Eleventh Federal Circuit Court of Appeals. Mr. Perron is also a member of the New Hampshire Bar, the Massachusetts Bar, and the Federal Court for the District of New Hampshire. Mr. Perron's extensive court experience includes violation of civil rights, broker disputes, contract disputes, creditor actions, and trust and probate disputes. Many of his cases have involved highly complex business torts such as multi-million dollar trust beneficiary disputes, claims against broker dealers for churning and mismanagement, disputes involving family limited partnerships, collections claims, and other complex business torts and contract claims. Mr. Perron has the experience and judgment to evaluate your situation, retain exceptional experts based on their past performance, advise you as to the local judge and jury makeup, and give you the information you need to make the best decisions in prosecuting your claim or defense. In addition, Mr. Perron has tried and settled matters before both the Financial Industry Regulatory Authority and the American Arbitration Association arbitration panels. He has obtained multimillion dollar settlements and awards for his clients. Mr. Perron has been a Florida resident since 1989, having relocated here with his wife Nancy. Mr. Perron received his Juris Doctorate from the University of Quinnipiac Law in 1985 and also holds a Master of Laws Degree in American Banking Law Studies (LLM) from the Boston University School of Law. He has served as Co-Chairman of the Twelfth Judicial Circuit Grievance Committee that regulates the practice of law in Manatee County. He currently serves as Chairman of the Unlicensed Practice of Law committee. Mr. Perron has lectured on a variety of Topics ranging from Banking to Ethics and Professionalism. Mr. Perron can be reached at 941-827-2228 or through thefinanciallawyer.com. Kristina Snyderman, Esq. is an Associate with the Barnes Walker Business Trial Group where she concentrates her legal practice in the areas of real estate, construction, and general civil litigation. Kristina is a native of Manatee County and a 2003 graduate of Manatee High School. 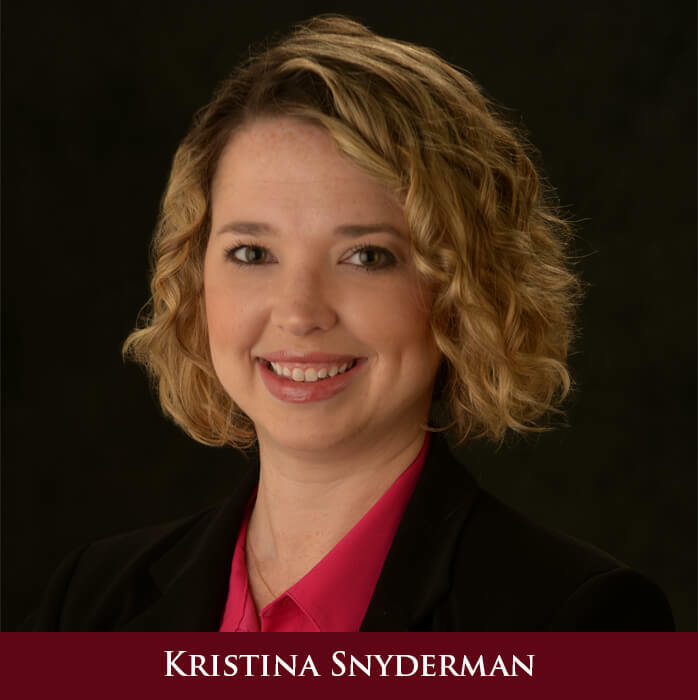 Ms. Snyderman can be reached at 941-827-2228 or through thefinanciallawyer.com.